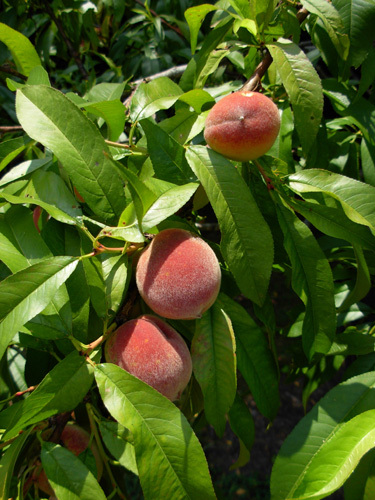 of big, luscious peaches that have an almost fuzzless skin over firm, creamy yellow flesh. 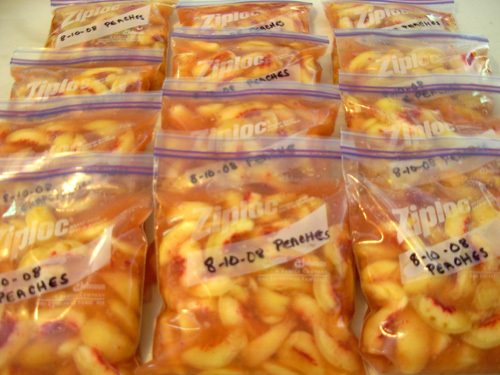 Fruit is medium to large size and is just right for fresh snacks, canning, or freezing." Until this summer, we haven't tasted any of our own peaches. And this year we were robbed of the chance to taste our own delicious Red Havens. Here's the story . . . 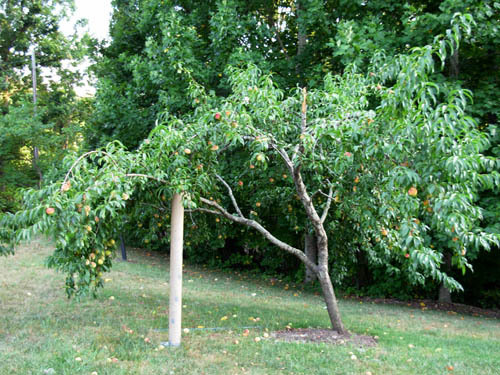 Along with all the nice flowerbeds filled with perennials, Jim and I also "inherited" two peach trees from the folks who lived here before us. However, we've never been here in the summer when they were ripe, so our neighbor Bob, who tends the place when we're gone, always got them (or so we thought). We were anticipating harvesting a bunch of fruit this summer and freezing and canning what we couldn't eat fresh. One is a cute little thing that is only about six feet tall -- the Red Haven, which is supposed to be a very tasty variety. 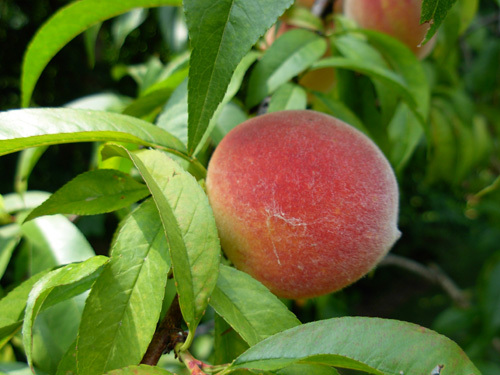 It's an early freestone peach that has yellow flesh and is ready to eat in the Roanoke area during July. You can see the tree in the left foreground in the photo above, its lower trunk protectively wrapped in a hard plastic tube. A few days after our visitors left, Jim went outside to inspect the peach trees. He's very proud of them. Even when we're gone in the summer, he's done the pruning and inspecting and early bug spraying during the late winter and early spring months. My job is culling the small peaches when they begin to grow so the ones that are left can reach their full size. Then we usually leave town and leave the peaches for Bob to enjoy. Since we were here this summer, I also did some spraying to keep the deer away from the lower leaves (using odiferous Liquid Fence -- really foul stuff!). Jim came back inside with an incredulous look on his face -- all the peaches on the little Red Haven tree were gone! Just GONE!!! There were dozens and dozens only a day or two before. Jim went back out to see if there were any pits on the ground. None. Probably wasn't the deer, we agreed. They'd most likely leave some pits. And anyway, they couldn't reach the ones on top, which were just as gone as the ones on the lower branches. It had to be a two-legged thief!! But who would do such a thing?? We didn't suspect any of the neighbors, since they all know we're home this summer. Maybe it's those construction workers down the road, building the new house. Or someone outside our small neighborhood who wants to sell them at the farmers' market -- I saw a suspicious red truck parked by our neighbor's apple tree along the road as I drove back home from my morning run and errands that day. We were furious. How dare someone come into our yard and steal all our peaches! They didn't leave even ONE. I called Bob. He wasn't real surprised. He said last year was the first he'd seen peaches on the little tree (they take a few years to bear fruit) and someone got them before he could harvest them last summer. We figured it was the same jerk who took them this year. Jim and I felt almost as violated as if someone broke into the house to steal something. We even worried about someone taking the dogs when we're gone! Two days later we were still bothered by the stolen peaches. Jim mentioned it to one of his friends at his fire department meeting that night and the guy started laughing . . .
. . . he said the thieves were probably SQUIRRELS!! This was totally new to us. The guy said he's watched as squirrels decimated his peach trees in just a few hours. They knock the peaches off the tree, then carry them off into the woods to eat later. They even work in teams sometimes! We thought just maybe he was kidding us. He's not. We "googled" it, and it happens a lot. We also confirmed the squirrel story with other neighbors at our homeowners' association meeting the next day. 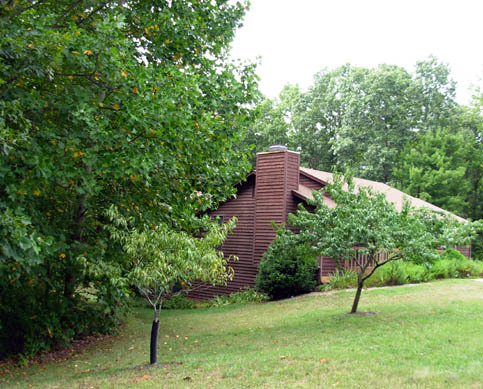 Since we have a gazillion squirrels around here -- and you can see that the little Red Haven tree is right under overhanging branches of a larger tree in the photo above -- that's probably what happened to ours. Those overhanging branches are like an open invitation. We're still shaking our heads and smiling sheepishly at all the nasty thoughts we had about a brazen two-legged thief stealing our peaches from right under our noses. I'm sorry we won't get to taste those peaches yet again, but I'd rather the thieves be hungry little squirrels than some redneck with no regard for personal property. 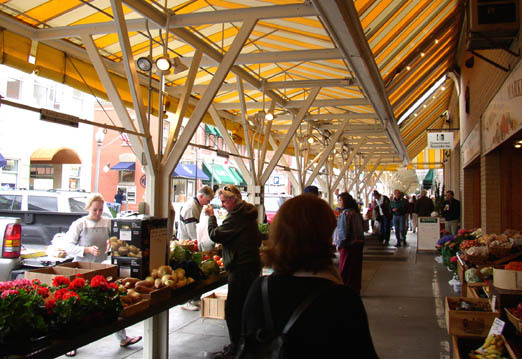 Meanwhile, we've been buying someone else's juicy Red Havens from the Roanoke Farmers' Market (above) for several weeks. They really are good! Maybe one of these years we'll get to taste our own. OK, we'd been warned. Now we had to figure out how to outwit the resourceful squirrels before they stole all the peaches from the OTHER tree! Some of the deterrents I found in various internet articles and forums weren't practical for us. The Belle of Georgia tree is too big for a net and the squirrels could still sabotage the peaches by knocking them off just before they reached their peak. (Immature peaches will soften but they won't taste anywhere near as good as they do if they're allowed to fully ripen on the tree.) Dogs and cats were mentioned as deterrents, but we don't have (or want) a cat and the dogs don't have access to the front yard. Throughout July the peaches got bigger and bigger. The branches sagged lower and lower. I took that photo August 6, soon after another large limb DID break off -- you can see the split end in the middle of the tree top. We lost about one-fourth of the peaches in one fell swoop. Lesson learned: the trees must be properly pruned every February whether we plan to be here all summer or not! 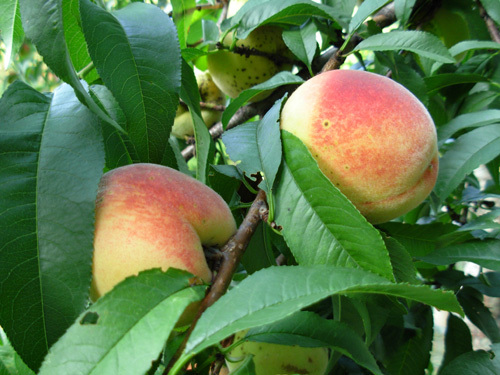 By the end of July, the Belle of Georgia peaches were starting to turn rosy red but they were still hard. One or both of us continued checking the peaches several times a day. We noticed that as the peaches ripened, more sported divots made by the birds. After the birds pecked into them, bees and other insects began eating the flesh, too. We still didn't see any evidence of deer eating the leaves or fruit, nor were any peaches missing that we could see. Our deterrents were useless against the birds and bees, but seemed to be working to keep the squirrels and deer away. Suddenly on the morning of August 9, I could see from the window that some peaches were missing from that low, heavily-fruited branch that was propped up. Oh, no! I rushed outside to confirm my suspicions.-- during the night deer had eaten many of the lower leaves, enjoyed some peaches, and left us the pits! 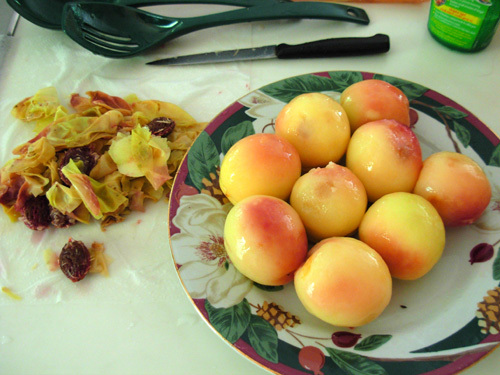 I sprang into action, picking every decent peach left on the tree, leaving only the ones that were too high to reach. Although they were getting soft, they weren't completely ripe. If I hadn't had that incentive, I would have left them on the tree a few days longer. I figured there wouldn't BE any more peaches within a day or two, and cut our losses. We probably harvested only a quarter or a third of the total number of peaches that grew to (near) maturity. We lost a bunch when the large branch broke, the deer got some, and the birds ruined the rest. Since I picked all the good peaches in one fell swoop, there were too many for us to eat fresh. I set aside a few prettiest ones to ripen for eating out of hand and froze the rest the next day. It's as messy a job as canning tomatoes but more fun and doesn't heat up the kitchen nearly as much. 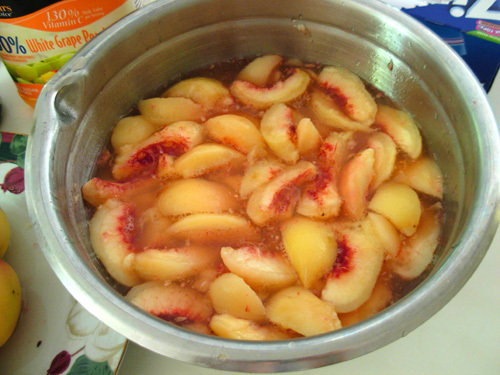 After being blanched in boiling water for 30-40 seconds, the fruit "chills out"
in ice water (above). Then it's easy to just slide the skins off (next two photos). One shiny, naked peach in foreground; the rest still have their skins. 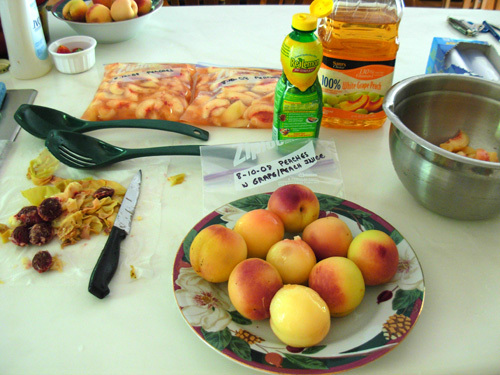 After slicing the peaches, I sprinkled them with lemon juice to prevent browning. You can also use a commercial product called Fresh Fruit, which is fine granular citric acid and vitamin C. I bought a bottle of Fruit Fresh for the occasion, then misplaced it. Still haven't found it! (CRS Syndrome strikes again.) Fortunately, I had plenty of lemon juice on hand. The next step is adding a sweetener solution. Instead of making a sugar-water syrup, I purchased two bottles of white grape/peach juice. I needed only one of the bottles for twelve quarts of peaches and still had a little bit left over. Correction: the last two steps are 1) cleaning up the mess! 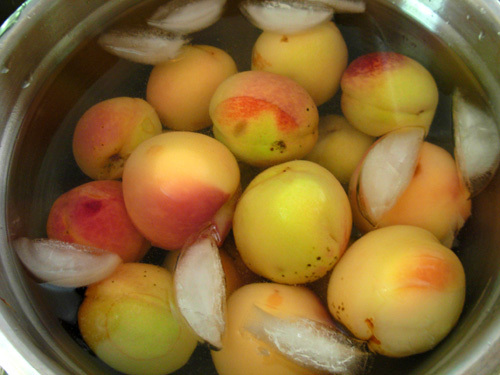 and 2) enjoying the frozen peaches when the fresh ones are all gone. And so the peach saga ends for 2008. We've learned some valuable lessons for 2009 and beyond, whether we are here to enjoy the "fruits of our labor" or not. And our neighbor Bob has learned that if we aren't here, he has to beat the squirrels and deer at their own game or he isn't going to get any peaches, either!